Sotheby’s Monterey auction saw a classic Ferrari 250 GTO sell for a world-record $48.2 million. 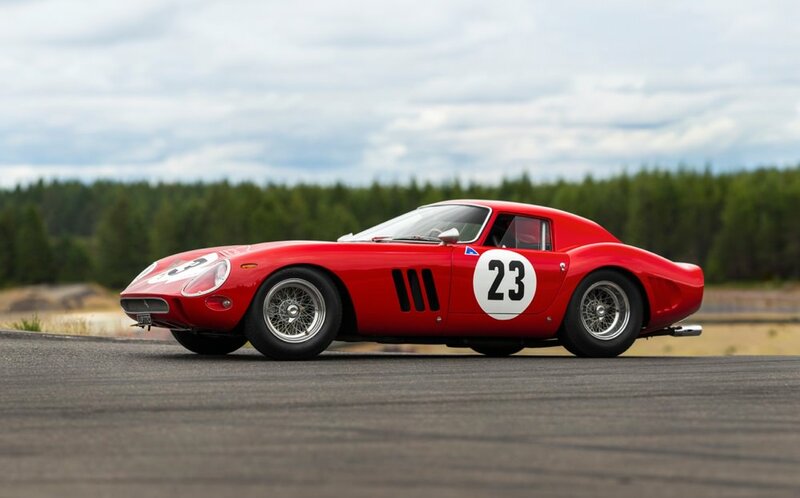 A classic 1962 Ferrari 250 GTO has smashed the previous world-record price for a car sold at auction, hitting an astonishing $48.2 million (€41.3 million at the time of writing) at a Sotheby’s auction in California, more than $10 million more than the previous record – also for a GTO. Bidding opened at a shocking $35 million (€30 million) to the gasps of the crowd and three telephone bidders competed against each other, the bids moving upwards in million-dollar increments, until the hammer fell at $44 million (the other $4.2 million consisting of the auctioneer’s fees). The auction, a three-day event, took place as part of Monterey Car Week, automotive nirvana on the Pacific coast. So how could one car possibly sell for such a truly obscene amount of money? The 250 GTO was built by Ferrari to take part in GT racing in the early ’60s, essentially a more refined version of its open-top 250P racer. A lot of the great names of Italian sports car design took part in its creation, including Giotto Bizzarini (chief engineer), Sergio Scaglietti (bodywork) and Gioacchino Colombo (designer of the car’s sublime V12 engine). Originally priced at $18,000 in the US (about €129,000 in today’s money), buyers had to be personally approved by Enzo Ferrari. FIA rules in the ’60s mandated that, in order to homologate a car for GT racing, 100 examples had to be built. An old story goes that Enzo Ferrari managed to trick the FIA by numbering the chassis out of sequence. After showing the inspectors one batch of cars, he reportedly invited them in for a coffee, afterwards taking them to another location to view the rest of the cars, which, of course, were simply the batch that had already been seen moved to a different car park whilst the inspectors weren’t looking. In actuality, there were only 36 examples built, meaning that the 250 GTO is a car of exceptional pedigree and rarity. The record-breaker, ‘chassis 3413 GT’, saw some action in its life, being driven in 1962 by the great American driver Phil Hill as a test car on the infamous Targa Florio, the fearsome and frequently fatal endurance race around Sicily. It was privately campaigned for years, winning the Italian National GT Championship in 1962 and taking class wins on the Targa Florio in ’63 and ’64. Aside from an impressive backstory, another reason that this particular GTO fetched such a premium is that it came with its original engine, gearbox, rear axle and factory body, somewhat unusually for a GTO considering that so many of them were raced, crashed and rebuilt over the years. That factory body is remarkable in its own right as it’s a Series II, one of just three built. Nevertheless, though $48.2 million is a record price for a car at auction, it’s a mere pittance compared to the $70 million (€59.9 million) paid in a private sale for another GTO (chassis 4153 GT) in 2017.